"Papa Doc + Baby Doc"
Papa Doc was a man for black nationalism and believed that voodoo was the true essence of Haiti. When he was a medical student he joined a group called the Le Group de Griots that had there own newspaper the Action Nationale. This helped spread some the ideas of black nationalism and voodoo to the poorest people of Haiti. This made him very popular. 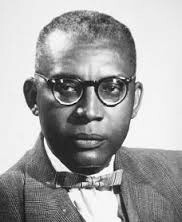 With this new popularity Duvalier ran for president in 1957 and won by the largest majority in Haitian history. 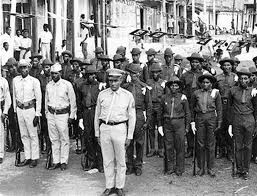 During his campaign Duvalier preached for social reform and black nationalism, but during his presidency he was more focused on keeping his power, since Haiti had six different governments in the ten months prior to his elections. Papa Doc thought everyone was out to get him. He established the Tonton Mascoutes which were to balance out the power of the army and terrorize political opposition. Duvalier then changed policies allowing him to keep power for as long as he could and eventually have his son follow in his footsteps. During his reign Papa Doc was able to establish a cult of personality where his followers said he was the perfect embodiment of the Haitian nation. Papa Doc only was concerned about himself and let Haiti's gross national product be the lowest in the nation. 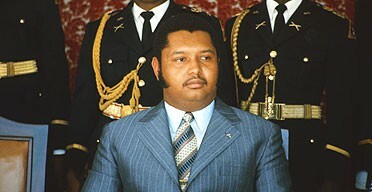 Jean-Claude Duvalier was raised to follow in his father's footsteps. After his father Francois Duvalier died in 1971, Jean-Claude inherited an impoverish nation with a 90% illiteracy rate. Jean-Claude stayed in for power for 15 years until he was overthrown in 1986. He stayed in power for so long because of the well established Tonton Mascoutes. During his presidency he did not improve the nation of Haiti, he just restored its image. He released many of the political figures that his father had imprisoned, but did nothing for the people. Jean-Claude was overthrown by a frustrated poor class, that violence and riots forced him to flee to France and leave military leaders in charge. After his departure Haiti installed a constitutional democracy that replaced the presidency for life. I dont think I can handle the pressure of being the next president. I am very young and have not accomplished anything significant. I lack the qualifications to run this country. If I step up to the challenge Ill do what you have taught me. I will run the country they way I want to and not listen to any other opinion. I will try to keep the Duvalier name in Haiti for aslong as possible. Dad, I do not want to disappoint you ill try my best but I'm just going to look out for myself. EQ: Why would Duvalier set up a group like the Tonton Mascoutes?